The HCA Track and Field team is having a fundraiser from now until March 30th, 2018 to support the costs associated with travel, equipment, and uniforms. 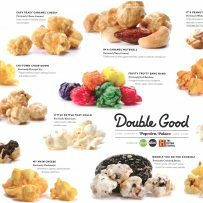 They are selling Double Good Popcorn in all flavors and sizes, as well as heavy duty trash bags. Orders can be placed after church services (at a table in the foyer) or by finding a track student, Melinda Metzger, or the HCA front office. Payments can be made to HCA via cash, check or online egiving.